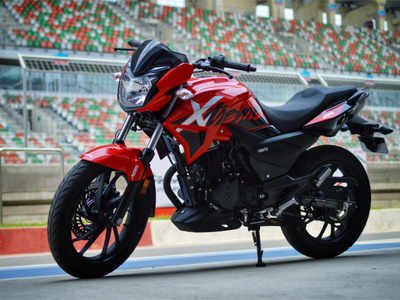 NEW DELHI: Hero MotoCorp is perhaps the most trusted brand in the commuter motorcycle segment, but breaking away from its comfort zone, the company has come up with an indigenously developed sports bike – the Xtreme 200R. 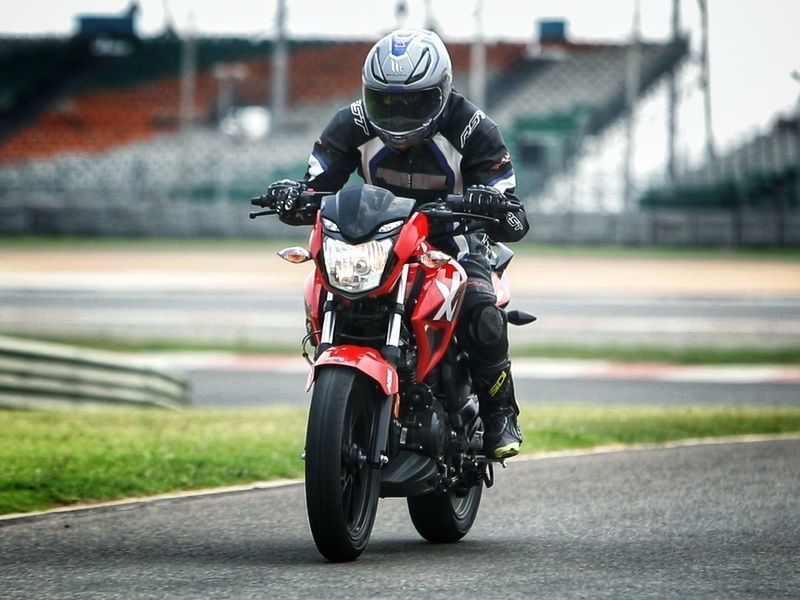 While it is yet to be launched in the market, we got to test ride the bike at the Buddh International Circuit’s Formula1 race track. Here’s what we thought of Hero’s comeback in the sports segment. 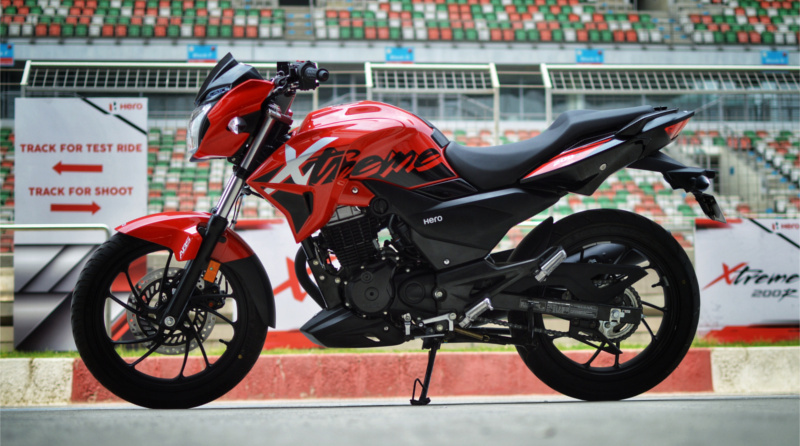 The base has been carried from the Xtreme Sports which comes with a 160cc motor. However, it is a bigger model in the series and that’s why the company turned it into an aggressive and macho-looking machine. The front mimics its sibling as it gets a similar headlamp cluster. However, the efforts are evident in the bigger fuel tank with prominent shrouds which add a sporty feel to the side profile. The highly contoured seat is no less than a split-type one and gives a different look to the motorcycle. But, the tail section along with tail lamp, which is carried from the older model, looks a bit outdated. 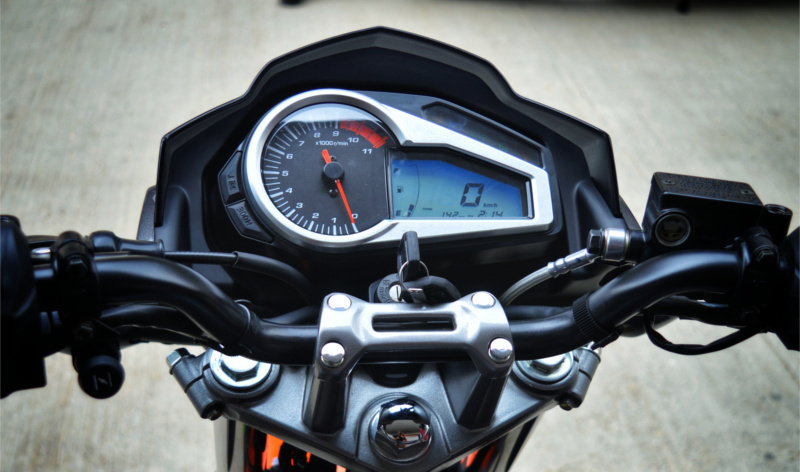 The digital-analog instrument cluster has been designed well but most of the new offerings in the segment offer a fully digital one with more features. Which can be considered as a drawback by the tech freak riders. 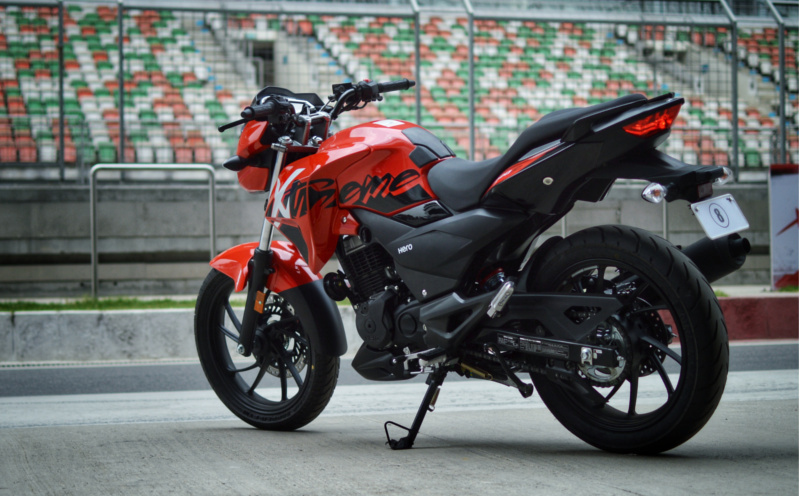 In term of parts, the Hero Xtreme 200R looks quite similar to the TVS Apache RTR 200 4V on paper with 37mm front forks, rear monoshock, front and rear disc brakes, and 130 section rear tyre. Both offer optional Anti-lock Braking System (ABS) as well but the Xtreme 200R gets a single-channel unit for the front wheel while TVS offers a dual-channel system. Seating is quite impressive, comfortable and well cushioned, and the riding posture is upright. The chassis of the motorcycle is quite communicative and you actually feel confident while riding the motorcycle. The front suspension has been balanced well and is neither too stiff nor too soft, while the rear gets a seven-step adjustment for spring preload. At the heart of the Xtreme 200R sits a 200cc air-cooled engine with basic configuration and a carburettor type fuel system. The claimed power and torque figures of the engine are 18.4PS at 8,000rpm and 17.1Nm at 6,500rpm respectively, which are lower than its competitors. The 200cc motor feels refined and smooth and the delivery is linear too. However, it doesn’t feel as punchy as the other motorcycles in this segment. However, that is not such a negative fact. The initial and mid-range are decent and the relax output could make it a good motorcycle as a premium commuter. What’s also positive is that the basic engine configuration would reduce the maintenance cost of the motorcycle. The gearbox is five-speed at a time when many other manufacturers are giving a six-speed unit with their 200cc motorcycles. The shiftings are smooth though and the clutch is also light. 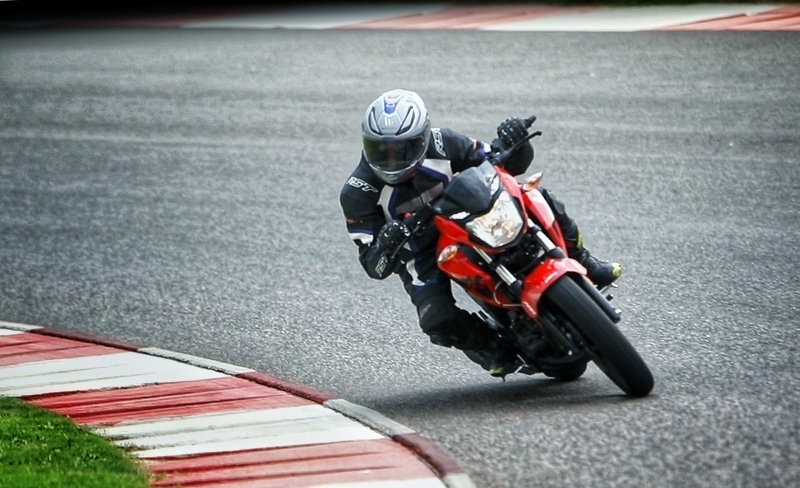 The bike goes over 110kmph but once you touch triple-digit speeds, the vibrations start to kick in. Other than the fuel tank, the overall design is not that aggressive. 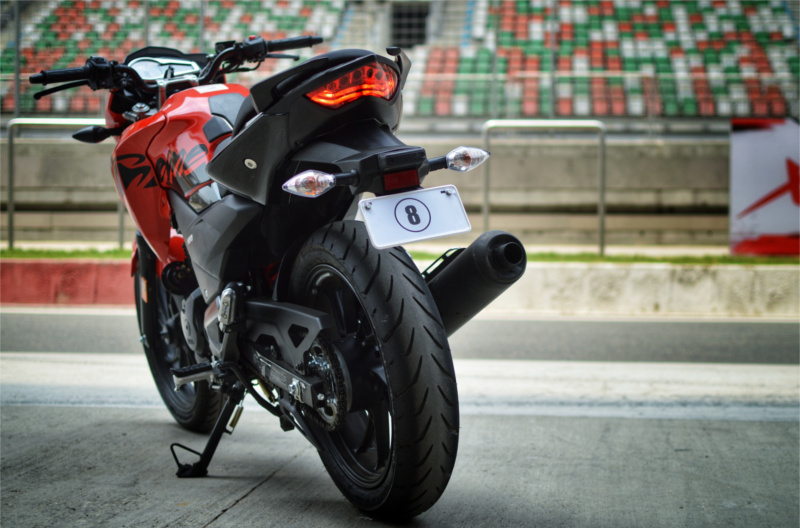 But, that doesn’t take away the fact that the Hero Xtreme 200R is a fun to ride motorcycle. It is a good balance between sportiness and comfort. While we rode the bike on a race track, this is one bike that is definitely meant for the streets. For those planning to take short weekend trips on a bike with a relaxed speed between 90-100kmph, the Xtreme 200R can definitely be considered. If priced right, Hero has a great comeback vehicle in the Indian sports bike market.